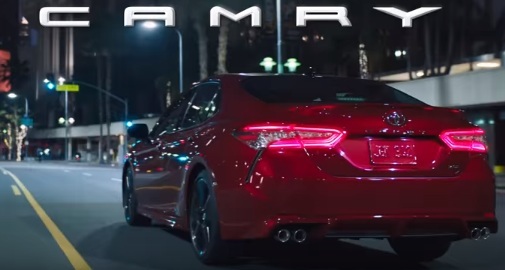 Toyota has launched a new ad campaign to showcase the 2018 Camry and some of its most important features. One of the spots, dubbed “Strut”, features a young man who, after ending a phone conversation, gets in his Toyota Camry to go pick someone/something up. He drives through the city, where he wows a woman walking on the sidewalk with the car’s new exterior design and the quality of the sound – thanks to the available 9-speaker, 800-watt Entune 3.0 Premium Audio with JBL x/Clari-Fi). The image of a peacock showing off his tail plumage appears, at some point, on the screen to illustrate the guy’s boasting attitude while driving around the all-new Camry. As the spot ends, viewers get to see what he was supposed to pick up: a pizza at a pizza restaurant that offers free delivery. The song used in the ad is John Cena’s single “The Time Is Now” (feat. The Trademark), appearing on his debut studio album, “You Can’t See Me”, released in 2005. This is the current entrance theme the wrestler uses as he makes his entrance to the ring. The 2018 Toyota Camry’s starting suggested retail price is of $23.495.